For many people, books are simply literature--pages with text. For me, as a lover of books, a book can be a work of art. The art of books dates back to the ancient tradition of bookbinding and illumination. Early books and manuscripts had numerous detailed illuminations meant for the illiterate, as well as magnificent bindings that required significant time and dexterity. The gilding of covers, the embossing of leather, and the marbling of paper are all different aspects of the process that require artistic skill. Books, even those filled with text, create sensory experiences. A book can activate four of the five senses. You hold the book and turn pages--touch; you read the words or look at the images--sight; you hear the pages turning or someone reading aloud--sound; and sometimes you can even experience a book’s aroma (the old bindings, the paper, and the ink)--smell. In the world of books, there is one genre that highlights the sensual potential of these objects: artists’ books. 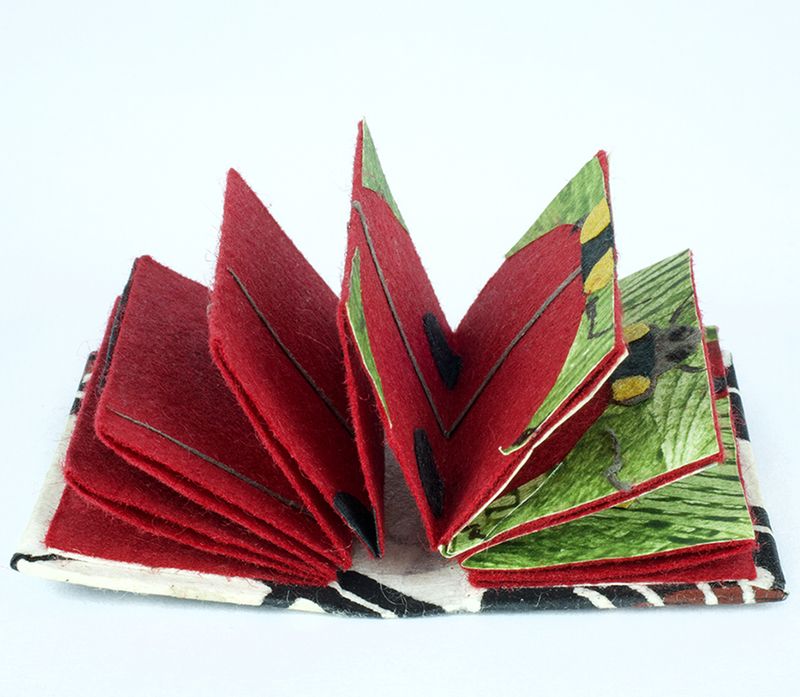 Artists’ books are, simply put, books made by artists. This definition does not quite do justice to the enormous creativity and diversity of objects and materials used to create these works. Metal, paper, glass, fabric, and stone are among the many materials used in artists’ books. According to art critic and writer Lucy Lippard, “Neither an art book...nor a book on art...the artists’ book is a work of art on its own.” Artists’ books stimulate the senses because they can be handled in a variety of ways: turned, flipped upside down, and even unpacked. Artists’ books function in a similar way to contemporary art: they are expressions of someone's creativity, often with an element of social commentary. In my capacity as a curatorial intern at MHCAM, I was lucky enough to be able to work with a collection of artists’ books, given to the Museum in 2018 by Marjorie (Jerry) Cohn, an alumna of the Class of 1960. After attending Mount Holyoke College, Cohn studied fine art and conservation with a focus on prints and works on paper. She served as a conservator at the Fogg Museum (now the Harvard Art Museums) from 1961 to 1980, and then became the curator of prints from 1989 to 2005. Cohn is now a curator emerita at the Harvard Art Museums, and continues to work with their print collection on a volunteer basis. Cohn is also a collector and has several different collections, including netsuke figurines and drawings by Japanese ukiyo-e artists. She first began collecting as a student at Mount Holyoke after meeting a print dealer in Dwight Hall. Cohn’s gift to MHCAM is comprised of nearly 70 artists’ books by women, including works by Lesley Dill, the Guerilla Girls, Angela Lorenz, Kiki Smith, Rona Pondick and many others. These works span from 1976 to 2007 and display a wide array of materials, formats, styles, skills, and subjects. Feminist themes are present in many of the books, some of which are lighthearted and playful, while others have darker themes with difficult subject matter. The breadth of the collection is amazing and gives a good picture of this underappreciated artistic genre. As an aspiring book conservator, I was thrilled to be able to closely examine these objects to see the diverse potential of the medium. Here are five of my favorite books from Cohn’s collection. Humor is undoubtedly a theme of my selections. This artists’ book is not in the typical format of a book at all, but rather, a pair of brand name jeans. The components are encased in a plastic bag, suggesting “a shopping bag… or… a wrapper cut to size” according to the artist. The paper has been made to look like denim and there is an obvious play on the words Denham and denim. Sir John Denham (1615-1669) was a poet who supported King Charles I during the English Civil Wars. After the Restoration, Denham also became a member of Parliament. A biography of Sir Denham is bound to look like a pack of playing cards--an ode to the fact that Denham was a gambler for most of his life. Lorenz has written Denham’s history in rhyming stanzas. The tag that usually would explain the history of the brand has small sections of texts by various authors who were contemporaries of Denham, along with examples of Denham’s poetry. To me, the way that Lorenz has described Denham’s life is hilarious, and the format of the work ingenious. I love this book because instead of referring to the colloquial idea of holding emotions or juggling aspects of your life, it takes “holding it together” quite literally. On each page of this small book is a detailed image of something that does just that: holds things together. For example, a safety pin, a paper clip, a hook and eye, or a screw. The cover of the book even has a small white button on it. This book is made out of US paper currency, and uses the imagery on one, five, ten, twenty, and fifty dollar bills to tell a story. The artists have transformed an everyday object that we rarely look at into a laugh-out-loud story about the kidnapping of President George Washington. The book is nestled into a safety deposit box. This book is part of a series of works by Mary McCarthy about ladybugs. One of my favorite aspects is how this tiny book reveals itself from within a match box which is inside a box. The detail and scale of this book is absolutely astounding. Each page is one small part of a ladybug--for example, a spot on a red background--that slowly progresses to show an entire ladybug. This is a small, unassuming book with a white cover that has been dog-eared in one corner. A tiny, replica dog collar fastens the book closed. Each subsequent page has a facsimile of an ear from a different species of dog and opposite the ear is the name of the species of dog that it belongs to. Fantastic! These five books are only a small sampling from Jerry Cohn’s marvelous collection.